Surprise surprise, there's a new Galaxy Note. Whodathunkit? But with the Mega on the scene, the new Note 3 isn't the leader of the pack when it comes to screen-size anymore. It looks like it's getting a little bump in screen size up to 5.7 inches from 5.5, and is actually a couple grams lighter then the II. But don't worry; it'll be bigger on the inside. The increase in screen size doesn't come at the cost of a bigger body. Instead, the bezels are down to almost non-existent to get that "bigger screen without being bigger" effect. That 5.7 inch screen is a Super AMOLED joint with a 1080x1920 display, and the phone its attached to it comes in black, white, and a whole bunch of other colors. A bunch of other colors of faux leather, that is. Those are faux leather backs. When it comes to guts, the Note 3 has a 13MP camera that can actually take 4K video, apparently. Yeah. Too bad you can't see 4k on its screen, or any other screen you are likely to own at the moment. It also has 3GB of RAM and a 3200mAh battery, just a touch of an improvement over the Note II's 3100mAh. 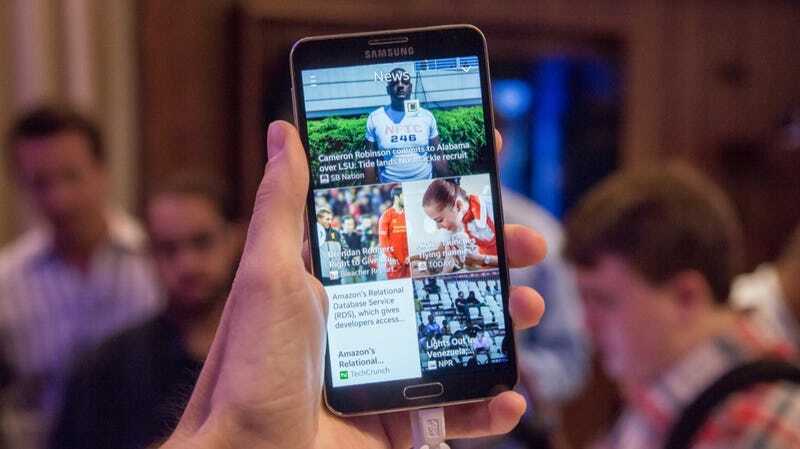 The Note 3 2.3 GHz Snapdragon 800 brain in the US. And as a bonus, the Note 3 LTE radio is 4 band, so it can handle any flavor of LTE out there. And of course, there's S pen news. This is a Galaxy Note after all, and these are what really matter when it comes to software features. Among the more useful ones, "Action Notes" will now let you write notes that link to actions, like a note of a phone number with a link that lets you dial it. Admittedly, these sort of S Pen features are exactly what the Galaxy Note 3 needs to make a case for itself as a phablet with a stylus, so the more the merrier really. But then there's the fluff. Like waving your stylus over the screen like a magician using "Air Command." Or using Samsung's Touchwiz flavored "S note" which actually links back into Everote and comes with a year of premium to make itself seem extra superfluous. And the software features only get more aggressively pointless from there. You can put two Note 3s next to each other to Voltron together into a larger screen, for instance. In case you are stranded on a desert island and want to watch Netflix on a slightly bigger screen with a line down the middle of it using the two Galaxy Note 3s you have, or something. Businesses are in luck though. The Note 3 offers Samsung's Knox security, which provides the kind of protection you'd probably need to use this sucker in a business context. Or in a paranoia context. Whatever floats your boat. Is this a pre-emptive push against a certain phone that might have a fingerprint reader? Maybe. Oh and there's also a new, 7.9mm thick Galaxy Note 10.1 joining the family, complete with stereo speakers, and it's lighter than its predecessor. Inside, the 10.1 has a big ol' 8,220mAh battery to keep it kicking. It'll come with all the software features the Note 3 has, of course. The Note 3, the Note 10.1, and the Samsung Galaxy Gear will all be available for purchase starting September 25th. They'll actually show up in the US and Japan in October. When all is said and done, Samsung is leaning very, very hard on a lot of wacky software features here, ones that practically feel like they're being made up on the spot. Samsung even went so far as to leave the Note 3's actual specs to the very end of the presentation in favor of these features. Actual specs that include being able to shoot 4K video. We'll have a hands-on coming up shortly to see how these gadgets hold up in person. Update: Here's some hands on!